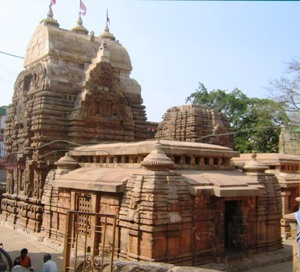 Representing the Khakhara order of the Kalinga School of architecture, the Vaital temple of 8th century A.D. is one of the oldest temple of Odisha and one of the rare temples in the entire country that was used as a shrine devoted to tantric cult. The deul (tower) of the temple is the most striking feature of the temple. Built in a rectangular shape and positioned at a right angle to the Jagmohana (porch), the temple bears an affinity to the Dravidian gopuram of the South India temples. The roof vault is brought about from earlier freestanding buildings made up of wood and thatch. The outer surface of the vault is plain, in contrast with the heavy sculptural embellishment of every other existing Odia temple tower. The shape of the more common Temple form has not been ignored, however; it has been carefully inserted, in miniature form, on the four corners of the Vaital Temple`s jagmohana (porch). A brief glance at the Vaital Temple projects an accomplished style of sculptural decoration. The medallion in the upper Chaitya-window houses a 10-armed Nataraja or dancing Shiva. In front of the flat roofed jagamohana is a stone post relieved with two Buddha like figures seated in dharma-chakra-pravartana mudra. Another striking feature is temple's tantric associations, marked by eerie carvings in the sanctum and the image enshrined in the central niche, eight armed Chamunda, locally known as Kapalini, is the terrifying form of goddess Durga. Thus Vaital Deul is a Sakta shrine.